We need to amortize the internal loop. Suppose we process the elements in an online fashion (e.g. in streaming). The elements already processed constitute the “history” of our data. For the next element \(p\), we need to search the “history” for the first element greater than \(p\). If our history is sorted, we can easily answer to the query with a binary search (or such). This is known as lower bound. Thus, we can use a sorted data structure supporting such an operation. In C# we can use SortedSet, left as an exercise. The cost of this solution is \(O(N \cdot logN \). What happens if duplicates kick in and 0 is not admitted as minimum loss? We should replace lower bound with upper bound, to skip the duplicates. Even more efficient is to preprocess data. Intuition: if the prices are sorted, the minimum loss is given by two adjacent prices. We just need to check if the pair is “valid”, that is: if the sell price is actually following the purchase (the sell is in the future). Thus, we can duplicate our data and add an index for each price. The index is ascending and it just represents then history. We only need to wipe out pairs that are not admittable, that is purchase happens after the sell. 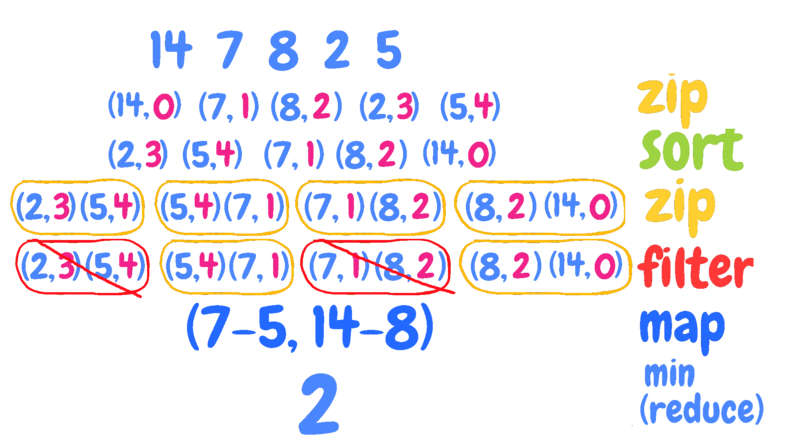 For example, (3, 2) and (4, 5) must be discarded because purchase (4, 5) happens after the sell (3, 2), since the position 4 is greater than the position 3. On the other hand, (4, 5) and (1, 7) are ok because (1, 7) is before (4, 5). The solution above is just an application of three patterns: zip | map | reduce. return p1.second < p2.second ?